I'm re-posting this afresh because I've added the additional code to change the post's font color, per request. This will change the font in the body of your posts on your blog page. Please note that this won't change how anyone sees your posts from their own dashboard and that this relies on the font(s) you choose being available on everyone's computer. That's why it's always good to list a few - if the first one isn't available on my computer, for instance, my web browser will try the next one in the list. From the settings/blog page, choose "Customise" as per usual. Yours may or may not have any text in them - it doesn't matter. 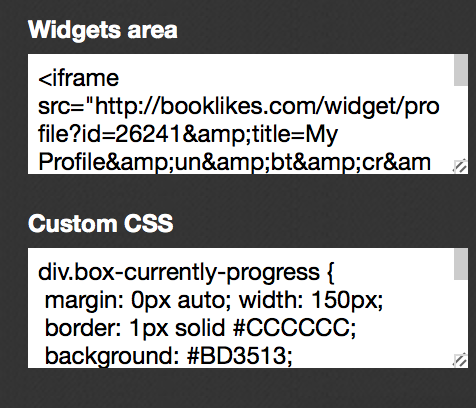 We're going to be working inside the "Custom CSS" box. Note: because this is confined to a very small space on the page, it can be tricky to work inside of it - I suggest using the arrow keys on your keyboard. The mouse/scrolling works but it can be very frustrating. Copy all three four of the above lines of text EXACTLY, and then paste it into the "Custom CSS" box. If you miss a bracket or a semi-colon the whole thing falls apart. Once you've changed those font names and/or color to reflect what you want, make sure that semi-colon is still there at the end of the last font. Hugely important. Hit "Save" at the top of the black frame. Load your blog page and behold your new fonts. If you regret your choices, go back to the Custom CSS window and change them. Save. Repeat as necessary. Or just delete those three lines and go back to the defaults. Again: copy/paste all three lines. Change the font faces. Make sure you don't accidentally delete that damn semi-colon. Save. Rise and repeat as necessary. Make sure you don't accidentally erase anything extra (like post-body stuff we did first) while you're doing this. This turns out not to be as easy as it should be; I think I've found an error in BookLikes' stylesheet hierarchy, but I don't think anyone wants me going on about that. What it boils down to is this: you can change your post title colors, but it's going to change the color of every link on your page. That includes the sidebar links to your other pages and the tags at the bottom of each post. 038050 is the default hex color code for the green. Change that to your color of choice.